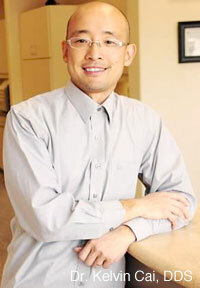 Dr. Kelvin Cai grew up in Fremont, California and attended Mission San Jose High School. After he graduated from UC Santa Barbara with a degree in Bio Chemistry he then attended New York University School of Dentistry, and graduated in 2002. After witnessing 9/11, a day in which he would never soon forget, he decided to move back to California where he associated in a group practice. With over 15 years of experience, Dr. Cai began in private practice in 2003 and took over Blackhawk Plaza Dental in 2012. Throughout the years he continued to learn and grow, experiencing the latest techniques and technology the dental field had to offer. Meanwhile, he has attended many continuing education courses in cosmetic dentistry, oral surgery, periodontal surgery, dental implants, and prosthetic care. His accomplishments in the dental industry are numerous. Dr. Cai’s breadth of education and experience in all aspects of dentistry has given him the ability to work closely with a variety of medical and dental specialists over the years. Dr. Cai is also a husband and proud father of two. His wife Vivian and his two boys Max and Derek reside locally. On Dr. Cai’s days off he spends most of his time with the family enjoying traveling, the outdoors, and sports. He is also a strong believer in giving back to his community. Dr. Cai has participated in Habitat For Humanity, a non-profit organization that helps build houses for families in need. Dr. Cai can also be found sharing his expertise, speaking publicly to health groups on a regular basis. Dr. Anju Aneja has been working in the dental industry for 15 years. She has a friendly demeanor and finds it extremely gratifying to deliver quality dentistry that makes people smile. Originally from Delhi, she graduated with a BDS degree in 2002 and also graduated with a DMD degree from the Boston University School of Dental Medicine in 2011. Thereafter, she worked with multiple dental offices in Massachusetts and the Bay Area. 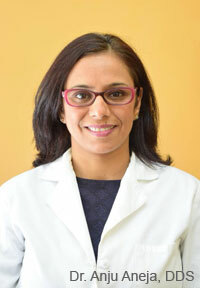 Dr. Aneja believes in constant improvement and likes to stay abreast of the latest techniques and technology. She has undergone continuing education in several specialized areas of dentistry including Endodontics, Lasers, Aesthetic Dentistry, dental implants, and Invisalign. She is an active member of the American Dental Association, California Dental Association and Contra Costa Dental Society. Dr. Aneja and her spouse have one son. When she isn’t busy improving your oral health she enjoys traveling, cooking, and reading. Call us today at 925-736-9860 to schedule your appointment, or for more information.